Yue Zhao, PhD, is Professor of Chemistry at the University of Sherbrooke. With more than 100 publications to his credit, Dr. Zhao's research interests center on the design, synthesis, and applications of new polymer and liquid-crystalline materials. He has worked on specific applications of light-responsive materials, self-assembled materials, and nanostructured materials for liquid crystal displays, controlled drug delivery, and tunable optical devices. Tomiki Ikeda, PhD, is Professor of Polymer Chemistry at the Tokyo Institute of Technology. Professor Ikeda is a leading authority in light-responsive materials and liquid-crystalline materials. Professor Ikeda's research interests focus on photomobile polymer materials, photodeformable smart materials based on azobenzene liquid-crystalline elastomers, and electroluminescent liquid-crystalline materials. He has more than 400 publications to his credit. 1. Azobenzene Polymers for Photonic Applications (Kevin G. Yager and Christopher J. Barrett). 2. Photo-Induced Phenomena in Supramolecular Azobenzene Materials (Joachim Stumpe, Olga Kulikovska, Leonid M. Goldenberg and Yuriy Zakrevskyy). 3. Photodeformable Materials and Photo-Mechanical Effects Based on Azobenzene-Containing Polymers and Liquid Crystals (Yanlei Yu and Tomiki Ikeda). 4. 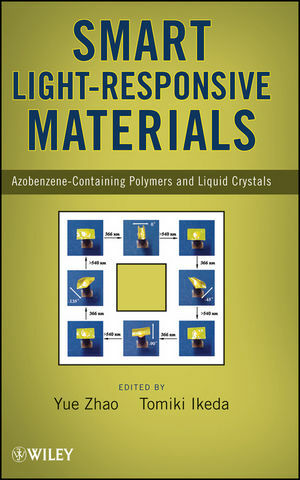 Amorphous Azobenzene Polymers for Light-Induced Surface Patterning (Kevin G. Yager and Christopher J. Barrett). 5. Azo Polymer Colloidal Spheres: Formation, Two-dimensional Array and Photoresponsive Properties (Xiaogong Wang). 6. Azobenzene-Containing Block Copolymer Micelles: toward Light-Controllable Nanocarriers (Yue Zhao). 7. Associates between Azobenzene-modified Polymers and Surfactants or Nanoparticles to Amplify Macroscopic Photo-transitions in Solution (Christophe Tribet). 8. Light-Responsive 2D Motions and Manipulations in Azobenzene-Containing Liquid Crystalline Polymer Materials (Takahiro Seki). 9. Photo-induced Immobilization of Molecules on the surface of Azobezene Polymers: Principles and Application (Osamu Watanabe). 10. Photo-tuning of Helical Structure of Cholesteric Liquid Crystals (Seiji Kurihara). 11. Tunable Diffraction Gratings Based on Azobenzene Polymers and Liquid Crystals (Yue Zhao). 12. Azo Block Copolymers in Solid State (Haifeng Yu and Tomiki Ikeda). 13. Photoresponsive Hybrid Silica Materials Containing Azobenzene Ligands (Nanguo Liu and C. Jeffrey Brinker).